The large number of patients and the high level of clinical research guarantees an outstanding clinical and technical experience for the medical team. All patients are offered a multidisciplinary programme of treatment and benefit from the latest diagnostic and therapeutic developments owing to the close interaction between the different physicians involved. Our team comprises hepatologists, digestive oncologists, hepatobiliary surgeons, transplant surgeons, interventional radiologists, histopathologists, virologists and metabolic specialists. This high quality of care is illustrated for example in a significant better long term survival after liver transplantation in comparison with the mean outcome in Europe and an excellent survival after surgery for pancreas cancer. Physicians within the Hepatobiliary Unit belong to one of the three main departments below. The Department of Hepatology at Leuven University Hospitals is a separate unit within internal medicine and treats patients with liver, biliary and pancreatic diseases. Our internationally renowned unit was founded as one of the first liver centers worldwide in 1963. An integrated approach combining day-to-day medical care and translational research ensures that patients receive the most ground-breaking drugs and therapies available. Over the past 10 years more than 100 clinical trials exploring new drugs have been approved by the hospital's Ethics Committee. All staff members in the department are internationally renowned and highly cited clinician-researchers. The unit has 32 specialist beds for patients with liver and biliopancreatic diseases with a mean severity-of-illness score of seven (mean score for internal medicine is five). UZ Leuven has a longstanding tradition of research in and clinical care for patients with inborn errors of metabolism. We follow a large cohort of pediatric and adult patients with mitochondrial diseases, porphyrias, wilson's disease, haemochromatosis, glycogenoses, phenylketonuria, tyrosinemia, lysosomal storage disorders, peroxisomal diseases, disorders of glycosylation. UZ Leuven is the only Belgian center providing specialised care for both metabolic children and adults and is the only center experienced with all transplantation modalities, also for metabolic patients. There is a close collaboration with the departments of pediatrics, neurology, genetics and clinical biochemistry. As a tertiary referral centre we see about 1 new patient per week with HCC. Patient records are reviewed on a weekly basis at multidisciplinary meetings. We can offer all established treatment options. One third of the patients are candidates for curative options (resection, radiofrequency ablation or liver transplantation). 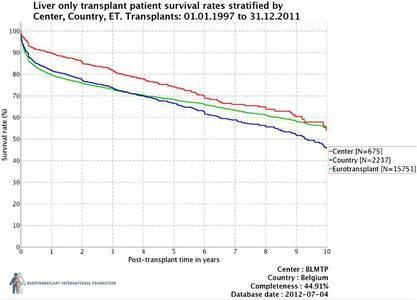 Of note, HCC represents an increasing indication for liver transplantation (currently 30% of patients on the waiting list). The remainder are candidates for embolisation procedures (chemo- or radioembolisation: 300 procedures the last 5 years), systemic therapy (chemotherapy, including sorafenib) or best supportive care. Transarterial chemoembolisation yields excellent results (60% response or disease stabilisation). The technique is safe, with an acceptable morbidity and is able to downstage the tumour. The HPB (hepato-pancreato-biliary) surgical team has a long tradition and continues to achieve excellent results in the field of HPB cancer (tumours), including laparoscopy where required. Minimally Invasive Laparoscopic Surgery: Following the first laparoscopic cholecystectomy in Belgium in May 1989, laparoscopic surgery developed considerably during the 1990s. Today, laparoscopic liver and pancreas resections are performed where required: please visit www.kulas.be for further details. Hyperthermic ablation of liver lesions, combined with partial liver resection. The multidisciplinary team includes oncologists, radiotherapists, radiologists and pathologists and the Department itself has been considered a tertiary reference centre for major HPB surgery for several decades. More than 750 HPB procedures are performed annually, including more than 80 pancreatic resections, 100 liver resections, 30 radiofrequency ablations, 30 procedures on the biliary tract for cancer. 60% of the liverresections are performed laparoscopically as well as 90% of the radiofrequency ablations for liver tumour. Some of these procedures can be viewed at the website www.kulas.be. A very low mortality rate after liver and pancreatic resectional surgery has been documented: 1.6% for liver resection, 3.1% after pancreaticoduodenectomy. The average postoperative length of stay was 10 and 20 days, respectively. The HPB team performs multidisciplinary research related to liver and pancreatic cancer. The most frequent form of liver transplantation is with brain dead donor. Under certain circumstances, it is possible to procure a liver segment from a living donor and transplant it into a child or into an adult recipient. The University Hospitals Leuven have experience in this procedure. Possible candidates (donor and recipient) for this procedure are screened using a multidisciplinary approach system. A clinical transplant coordinator dedicated to the living-donor programme is responsible for the organisational aspects of the programme and gives information and support to the candidate donors and recipients throughout the process. Leuven University Hospitals is the only centre in Europe currently performing living-donor intestinal transplantation in patients with intestinal failure. Hepatology: F. Nevens, S Van der Merwe, W Laleman, D. Cassiman, C. Verslype, W. Van Steenbergen.